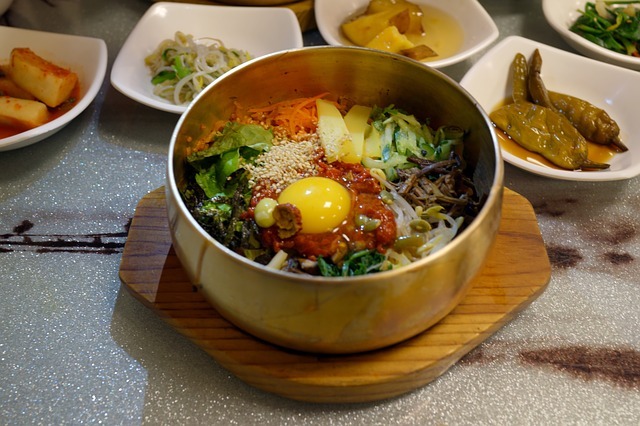 Bibimbap recipes can be altered to suit your individual preferences. And there are so many variations that you can experiment with or create when making a Bibimbap recipe. You can make a more cooked version of Bibimbap if that suits your taste buds. Or if you're into eating raw foods, make a Bibimbap recipe that includes raw meat, raw vegetables, and a raw egg yolk. You can even make a lower carb Bibimbap with Shirataki rice if that is what makes you happy. Add the ingredients to a blender and blend until a smooth consistency. Then transfer sauce to a serving bowl or cup. Use this sauce as a replacement for the Gochujang sauce. Just place ingredients into a small bowl and mix together. Place ingredients into a bowl and mix everything together. Put aside and let meat marinate. Heat a pan on medium high heat and add 1 tsp. oil with a pinch of salt. Saute zucchini for 2 to 3 minutes or until softened. Repeat the process for the other vegetables - add in a little oil with a pinch of salt and cook until soft. Mushrooms may take a little longer to cook. Then turn the heat up to high and cook the marinated meat for about 7 minutes. Brush stone pot with 2 tsp. sesame oil and place the rice in the center of pot. Now arrange your vegetables around the edge of the rice and place different colored vegetables next to each other. Then place the meat right on top of the rice in center. Next, heat the stone pot until you hear a sizzle and then remove from heat. Serve with a sunny side fried egg, sprinkle of sesame seeds, and Gochujang sauce. Break the egg and mix everything together before consuming this Bibimbap recipe. 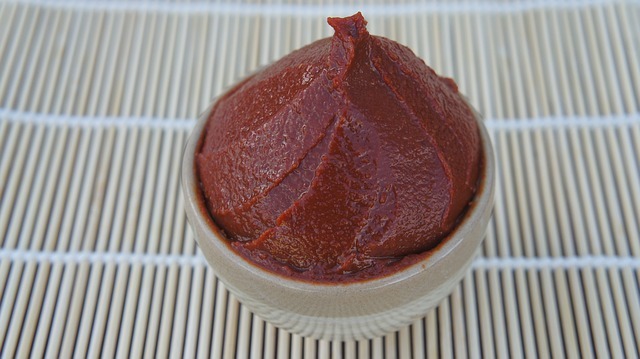 Gochujang is a fermented Korean red chili paste that has a savory, sweet, and spicy flavor. The main ingredients that you will almost always find in a good Gochujang are Korean hot peppers, fermented soybean paste, glutinous rice, and salt. And there are sometimes a couple more additional ingredients depending on the brand. However, most of Gochujang's distinctive flavor comes from the hot peppers and fermented soybean paste. And a really good jar of Gochujang isn't that easy to find, so you may have to create an alternative for your Bibimbap recipes. Heat up the water and sugar on medium heat in a small pan until sugar is melted. Turn off the heat and add the miso paste. Stir until the miso paste is completely dissolved. Turn the heat back on to very low and gradually whisk in the Korean red chili powder (about 1/2 cup at a time) until the desired heat level is reached. After everything is well combined and the mixture starts to bubble, turn off the heat. Add a little more water if needed, then stir in the salt and rice vinegar. Adjust the taste of sauce if needed. Let cool completely for a few hours and then transfer to a glass jar to store in your refrigerator. Making an alternative version of Gochujang may be a better option - if you can't find a good quality jar of Gochujang in your grocery store to season your Bibimbap recipes. Add ingredients to a bowl and stir to combine sauce ingredients. Add the raw meat, green onion, and shredded cabbage to the sauce - mix well. Add cooked white rice to a bowl and arrange lettuce, perilla leaves, and bean sprouts around the rice. Add the seasoned raw meat on top of the rice and place a raw egg yolk on top of the raw meat. Drizzle with a little sesame oil and toasted sesame seeds. Break egg yolk and mix everything together before consuming your raw meat Bibimbap recipe. Open the packages of Shirataki rice and rinse well. Fill a small saucepan halfway with water and bring to a boil. Add the Shirataki rice and stir 1 to 2 minutes - then drain out the water. Toss with toasted sesame oil and set aside in a bowl. In a skillet, heat ghee and add the carrots - saute for 1 minute. Then add the zucchini and Gochujang - stir until well coated. Season and put into a bowl. In the same pan add another 2 tsp. of ghee and brown the ground beef for about 2 to 3 minutes. Fill a saucepan halfway with water and bring to a boil. Add the bok choy and blanch for 1 to 2 minutes - drain and squeeze out any excess water. Toss bok choy with 1 Tbsp. of coconut aminos, 1 tsp. toasted sesame oil, and sesame seeds. In a small skillet heat 1 tsp ghee over medium-low heat. 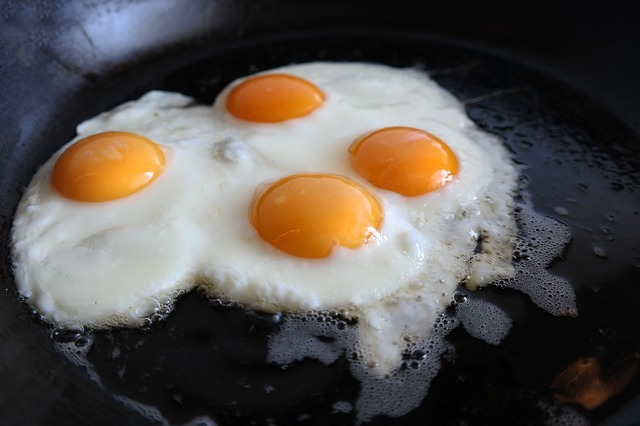 Cook eggs until the yolks are runny, but whites are firm (about 2 to 3 minutes). Place half of the rice at the bottom of each bowl. Arrange a portion of vegetables, beef, and bok choy around the perimeter. Top with fried egg and scallions. Serve immediately.